With inter-Korean ties appearing to move forward, South Korean food and beverage companies are cautiously pinning hopes on expanding their businesses to the other side of the peninsula, eyeing the some 25 million potential consumers in the North. Retail giant Lotte Corp. said Tuesday that it has formed a task force to work on the group’s business expansion to North Korea. Its food and beverage affiliates Lotte Food, Lotte Chilsung and Lotte Confectionery will lead the business under a CEO-level executive’s supervision, the company said. Lotte had created a business division in 1995 to push ahead with establishing production lines for Choco Pie and bottled mineral water in the North. The project received the government’s approval but floundered after South-North relations soured. In 2008, Lotte supplied Choco Pie to South Korean companies operating in the Kaesong industrial park. Each day, South Korean managers overseeing the project would give North Korean laborers Choco Pie as snacks. The chocolate cake snack with marshmallow filling soon became popular, but giving out Choco Pie to North Korean workers was banned in 2014, as it was being sold by the workers on the black market for money. Lotte said at least 1.2 million boxes of Choco Pie worth 120 million won ($110,940) were sent to the North from 2008 to 2014. “Lotte Founder Shin Kyuk-ho has always been interested in doing business in the North. Based on our previous experience of delivering products to North Korea, we expect we can start off (our business in the North) with our food brands,” a Lotte official said. 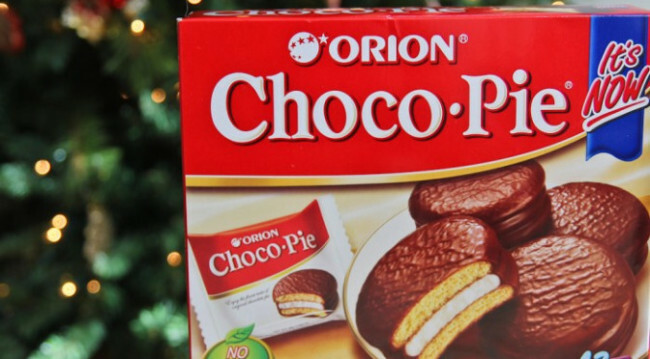 Orion, which first introduced Choco Pie to South Korea in 1974, had supplied the product to Kaesong industrial park from 2004. The company is also watching the situation closely. An official from Orion said Choco Pie could serve as a good starting point to drive business expansion in the North, given the iconic image of Choco Pie there. Food companies are also raising hopes of reduced distribution cost. 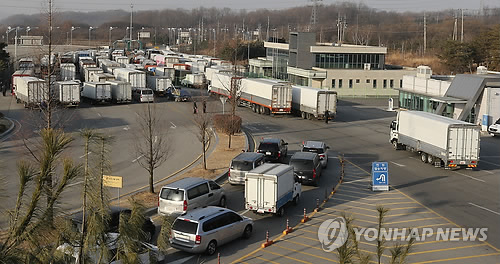 Food and beverage company Nongshim, which manufactures bottled mineral water Baeksansu in Yanbian, China, expects to see a shortened transport route if cross-border roads through North Korea are opened. In 2015, the company had seen its transportation route shortened by 800 kilometers during its trial transportation of 170 tons of Baeksansu via North Korea’s Port of Najin. “If cross-border railways or roads become accessible from the South’s side, it would not only reduce the cost of distribution, but also support easier entry to other markets like China and Russia,” said an industry insider. Meanwhile, convenience store operator BGF Retail, which had operated three CU convenience stores in Kaesong industrial park, is also looking out for opportunities. Other food groups such as SPC, Sempio, Ottogi and Pulmuone whose founders were from North Korean cities, are also expected to push ahead with business expansion to the North. Industry insiders say that North Korea could become the next “blue ocean” market for South Korean food companies and vitalize the stagnant domestic economy. “As North Koreans are likely to have similar appetites and taste preferences as South Koreans, food companies will see a lot of potential in the North Korean market,” said an industry insider. “Although North Korean consumers’ income level is not as high as those in the South, in the long term, the North Korean market could be a breakthrough for South Korean companies, which are struggling due to the continuously falling birthrate and reduced economic spending here,” he said.